QuiltWoman.com does not have a booth at the notorious Sample Spree event held the first night of market. This allows our team to attend the spree and shop like wild. 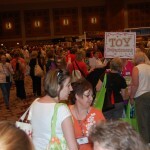 Sample Spree is an event where companies offer their product for sale in one-two type quantities at wholesale prices. It’s great for designers who benefit from these fabric and design companies, but might not have a large wholesale account opened with the companies. It is a notorious event because designers are not the only ones who benefit. Many shops bring staff or friends to the event- people who may want wholesale items for themselves, rather than their shops. As a result, tickets are sold and capped off (are you sitting down to hear this?) NOT WHEN they run out but WHEN the ticket sales reach the fire code maximum occupancy! You can get still get into the spree as people start to leave- you just have to be patient. Ladies wait in line to get into the spree as early as 4pm for the 8pm opening. Oh yes, it’s at night. After a whole day of travel & schoolhouse- 8-10pm is a wholesale shopping extravaganza. Buy as much as you can carry because when items are sold out, they are gone. Period. These shots are from Sample Spree during the second hour, as the crowd started to thin (and I was done with most of my shopping!). 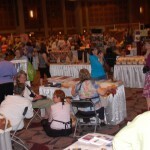 Sample Spree at Quilt Market is probably at the top every quilter’s Bucket List. Quilt Market was last weekend. My Instagram feed was full of pictures of new fabric collections, designers beaming proudly in their beautiful booths, and the crazy crowds at Sample Spree.